Spread over three floors, there’s loads of interest for everyone! 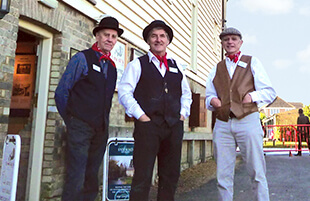 Information panels describe the Mill’s thousand years of history and the restoration after the disastrous fire of 1992 and our Milly Mouse signs direct visitors’ attention to key points around the building giving an insight into the milling process and the history of the Mill and its restoration. 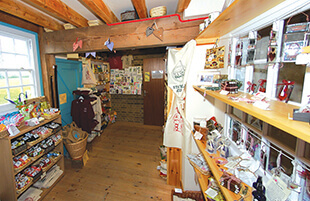 ‘Milly Mouse’s Missing Words Trail’ leaflet is designed for children to explore the trail for themselves. 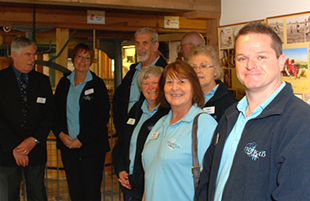 There is also a guidebook available for sale in the Kingfisher gift shop and volunteer guides are available to answer visitors’ questions. 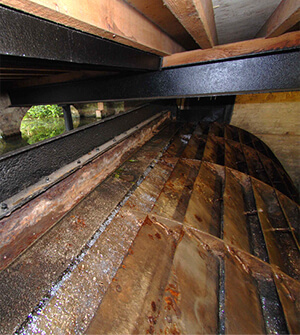 The 4.2 metre wide overshot corn mill waterwheel, is the widest in the country. 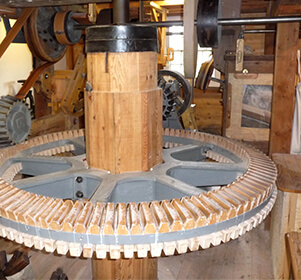 The original restored cast-iron hursting frame, installed in 1897 by Whitmore & Binyon supports the millstones, along with the driving gears which include the great spur wheel, wallower and the main drive shaft. These are driven by the power generated from the overshot waterwheel. On display is a remnant of the original upright shaft and the diesel engine used to power the mill machinery in the early 50’s. Two sets of millstones, one is the original set of restored French Burr millstones and the other is a set of new composite stones. Children can grind their own flour using our small quern stones to help them understand the process – they can even take home their small bag of flour. Various exhibits include a charred remnant of the original great spur wheel and a replica of a millers smock. 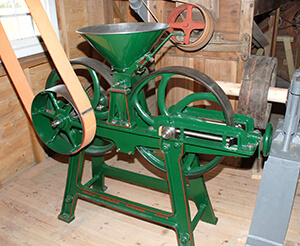 There is a range of dressing equipment for cleaning the grain and sifting the flour plus an oat roller. Plus a full working scale model of the Mill and various exhibits. All floors are fully accessible, for further information download our Access Statement.